Must see/ Must eat! Mini Doughnut Factory! Tampa. Having only been living in Clearwater for just over a month, we thought it would be fun to do a little research and find out more about the area and what it has to offer. Being huge foodies we naturally looked up the must visit places for yummy treats and delicious food. 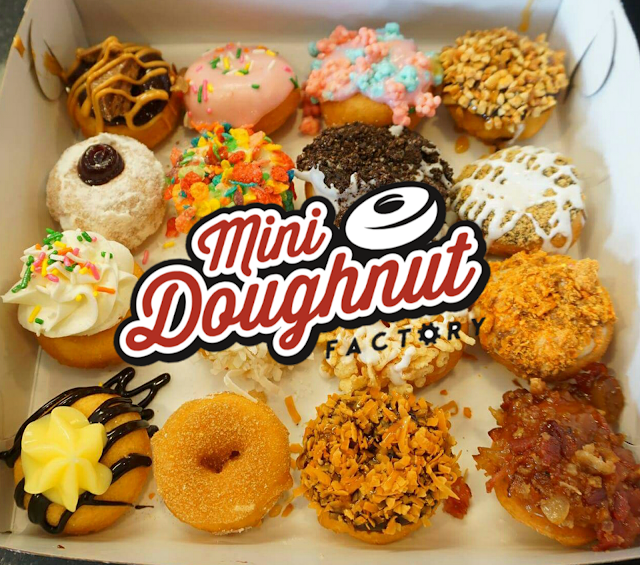 The Mini Doughnut Factory popped up on our Instagram and we immediately knew we had to pay a visit. Last Friday we jumped in the car and headed to the Mini Doughnut Factory arriving at around 11:45. It was busy, with their cozy wooden tables already packed with families and a constant flow of people coming through the door. We studied the menu and decided that we basically had to try one of everything, so we ended up getting a box of 16 for $11.65, as well as a refreshing 'Cold brew on tap' coffee. When it was our turn to order we were welcomed with a bright smile by Patrick, one of the owners, who greeted us with "Which one is Lucy and which one is Kelly?" We had been tweeting them and telling them we were going to visit and thought it was incredibly sweet that he remembered. He was absolutely lovely to talk to and had us laughing and made us feel right at home. If you know Kelly and I you know we love to chat and it always makes us smile when we meet friendly, happy people who are kind and thoughtful. Patrick and his wife would make us go back purely for being them, never mind the doughnuts... but lets talk about these doughnuts, shall we?! 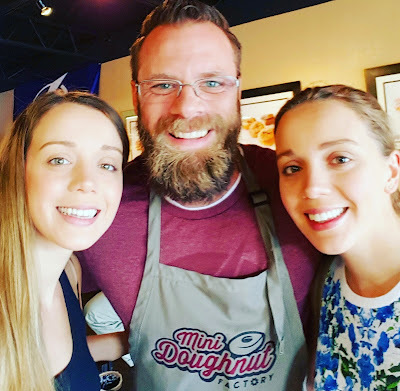 We were tempted to write down each doughnut we tried and give you the verdicts on which ones you MUST TRY, but in all honesty, and we kid you not, every single one was delicious. Each one tasted fresh and was full of flavor. The soft, cakey, doughnuts themselves melt in your mouth and seriously taste like heaven and as for the toppings, each one worked perfectly with the base and made each bite unique and scrumptious. Chris O: At first Chris said the Snickers and Peanut butter cup were his favourite, then after thinking for a few minutes he said, actually they were all really awesome, I can't choose. Kelly: I am a huge lover of coconut so I'm going to go with the LeLe Coco doughnut and the Samoas, both were different in flavor as even though they both had toasted coconut the Samoas was slightly more toasted coconut on top, both were equally delicious. Chris S: Chris's favourite was a tie between the bacon doughnut and the butterfinger one. This is a gorgeous place, and I won't soon forget it. Attended an event here sponsored by the company. The reception hour at the party venues was held in one of the rooms next to the hall. I loved their buttery mashed sweet potato.